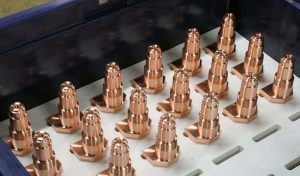 An Italian-built Biglia CNC lathe with twin-opposed spindles and three Y-axis turrets supplied by Whitehouse Machine Tools has taken over the manufacture of terminal lugs from 38 mm diameter copper bar at the Plymouth factory of subcontractor Morris Engineering. The improvement has been dramatic. One-hit cycle time to machine the component at both ends has been reduced to just three minutes, compared to 21 minutes previously required by a twin-spindle lathe with a single Y-axis turret, which has now been replaced by the Biglia turning centre. Managing director Tim Winzer commented, “We could not have accepted this job on a long-term basis without investing in a new machine, as the contract would not have been profitable. “The cycle time has been reduced by such a large amount because we are able to carry out a lot of balanced turning and milling at both spindles, as the third, lower turret serves both. Often during the cycle we have three tools in cut simultaneously. The Biglia Quattro 465 T3Y3 lathe with a Fanuc control and Marposs tool probing was installed at the Plymouth factory in January 2016. It was preceded by extensive applications engineering at Whitehouse Machine Tools’ technical centre in Kenilworth, where the terminal lug production process was established and programs were written for producing three variants, followed by a one-week prove-out of the lathe cell. When the subcontractor was visited the following month, the machine operator commented in the afternoon that a full week’s production of terminal lugs had been completed on that day using the new lathe. An LNS Quick Load Servo 80 magazine was supplied as part of the package from Whitehouse Machine Tools for loading one-metre bar up to 65 mm diameter. In the case of the 38 mm copper stock, 17 such bars can be held in the magazine, providing considerable potential for lights-out production between the end of the second shift at 1.30 am and the 7.00 am start of the first shift on the following day. Unattended production is of considerable benefit to the subcontractor, which traditionally has produced batches of between one and 500 but which is now routinely producing 2,000s and quoting for jobs involving quantities of 15,000 and above. Two lathes for the price of one Morris Engineering considered various triple-turret lathes on the market and found that for the price of one competitor’s machine, two Biglia lathes could be purchased. The decision was therefore taken to buy a pair of the Italian-built machines. A second, smaller Biglia twin-spindle lathe, called Quattro 436 T2Y2 with two Y-axis turrets and a Mitsubishi control, will be installed in March 2016. There are two major advantages for the subcontractor. First, production potential is doubled by having two machines rather than one. Second,the smaller Biglia lathe with its more nimble axis movements will be even more efficient at producing turn-milled parts from bar at the lower end of the size range, up to its maximum bar capacity of 36 mm. According to Morris Engineering’s production director, Antony Dyer, the smaller lathe is so quick that its cycle times can compete with those of sliding-head turning centres. The subcontractor therefore plans to bring in-house a considerable amount of Swiss-type work that is currently subcontracted out. Mr Dyer added, “When mills are in cut in the driven turret stations of the Quattro 465, they sound as though they are on a machining centre. It is not like listening to a lathe trying to mill. 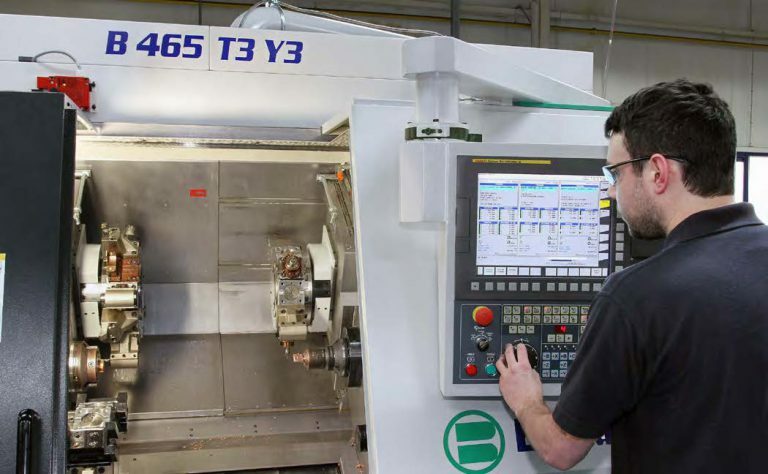 “With its three 12-station live turrets, the turning machine has already taken a large workload off our milling section and has freed a lot of capacity. “When the 436 machine arrives, even more machining centre time will be saved. “Additionally, by not having to transfer nearly as much work from the turning section for a second operation, work-in-progress is reduced. “We also gain all the usual benefits of one-hit production, including higher accuracy parts through not having to re-fixture them and lower scrap levels. Optimisation of tooling is a particular focus at the Plymouth factory, with the production team already using 4-to-1 speeder heads to attain rotational speeds of up to 20,000 rpm. 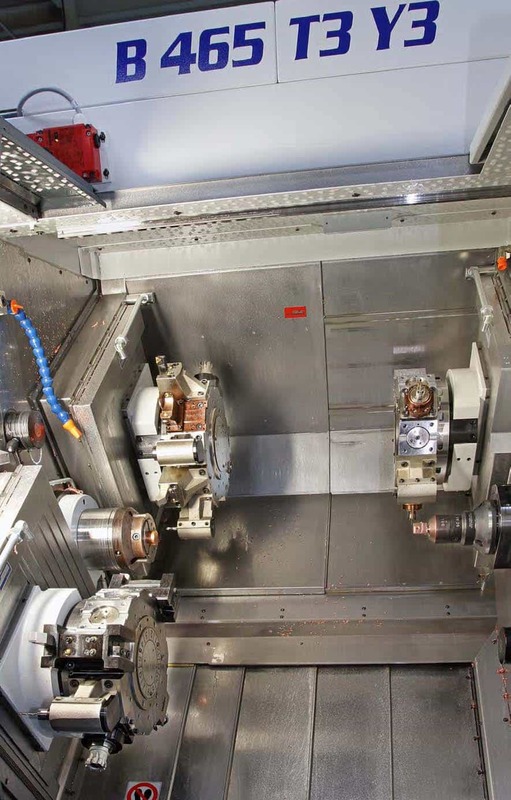 A system of pre-set quick-change tooling is currently being investigated for both Biglia lathes. There are a number of features of the Biglia Quattro build that Mr Dyer particularly likes. One is the provision of a twin conveyor arrangement on the output side, rather than a parts catcher. A component emerging from the machine on one conveyor is directed onto a second conveyor at right angles that carries it into a waiting container at the front. However, by the time a bar remnant arrives on the first conveyor, the control has already told the second conveyor to reverse direction so that the bar end is routed to another container at the rear. Another feature specific to the Quattro 436 is that the counter-spindle has two degrees of freedom, in the Z-axis as well as the X-axis, allowing it to be offset by 170 mm from the centreline of the main spindle, eliminating interference between the turrets when simultaneously machining the front end and reverse end of complex components. It also allows an unusual arrangement where a tailstock can be advanced in the space vacated by the offset counter spindle to enable turn-milling between centres using the main spindle and simultaneous reverse-end machining by the counter spindle and second turret. A general observation Mr Dyer makes about the turning centres is that they have manageable working envelopes with easy access to the turrets for tool exchange. Additionally, steep guarding discourages swarf from collecting on machine surfaces. As a postscript, Tim Whitehouse, Managing Director of Whitehouse Machine Tools commented, “Biglia were early into the market with their Quattro twin-spindle, multi-turret lathe design, having produced the first model more than 25 years ago. “They manufacture a small range of machines that are highly optimised to minimise non-cutting times.